2. Beit Tsindlikht, a Chabad-operated year-round preschool, is currently in its sixth year of operation in attractive, newly renovated premises – a two-story rectangular building - near the center of the city. Its rooms are spacious and well-equipped, and its grounds include a variety of play apparatus. Highly regarded in Dnipropetrovsk, the preschool currently enrolls 150 children between the ages of 2½ and six in space intended for 140. The preschool is operating “at the very limits” of available space, said Yudit Baram, the highly respected principal. A plan to open a branch on the east bank of the Dnipr River in space controlled by another Chabad institution collapsed when Chabad refused to pay bribes in return for city operating permits. At least 25 families in that part of the city had already expressed interest in such a branch location, said Mrs. Baram, and she is certain that other families would have come forward as soon as Chabad had declared that it would open. Beit Tsindlikht pupils are divided among six groups according to age. Two of these groups, with a total of 50 children, constitute a heder with an enhanced Hebrew-language program taught by Israeli teachers. About 90 percent of the heder children are from Chabad families, most of whom are from Israel; their parents work in various Chabad programs in the city. Children in one of the heder groups gather for circle time at Beit Tsindlicht. Pre-schoolers in the back are carrying chairs forward to join the group. Ninety-five percent of all pupils at Beit Tsindlikht are halachically Jewish; the remaining five percent are from intermarried families who have a strong relationship with the Chabad community. Most families pay approximately $44 monthly in tuition fees, said Mrs. Baram, but about ten youngsters are enrolled at $20 monthly, and another six or seven families pay nothing at all. The program is full-day and includes both breakfast and lunch. 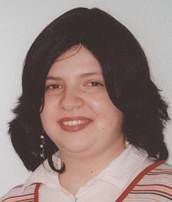 The overwhelming majority of Beit Tsindlicht pupils, perhaps 95 percent, con-tinue their education at school #144 (see below), many of them in the machon or yeshiva sections of the school, Mrs. Baram stated. The remaining five percent enter other schools, usually because their families have some connection with such schools as teachers or administrators, said Mrs. Baram. However, notwithstanding these con-nections, such youngsters often transfer to school #144 after a year or two in the non-Jewish school. Yudit Baram, right, is the Israeli principal of Beit Tsindlicht. Beit Tsindlicht, stated Mrs. Baram, employs a staff of 18 teachers, eleven of whom are graduates of Beit Chana. (Most of the remaining seven teachers completed pedagogical training in Israel.) Additionally, continued Mrs. Baram, another two or three teachers also are completing bachelor’s degrees (after earning a teaching certificate) or master’s degrees at Beit Chana on a part-time basis. Beit Tsindlicht cooperates very closely with Beit Chana, she added, noting that some Beit Chana students do their practice teaching at Beit Tsindlicht. Mrs. Baram noted with pride that Beit Tsindlicht sends a letter home with each child every Friday. Tailored to the age group in which the child is en-rolled, the two-page letter describes the theme of the week (such as the beginning of spring), progress in both Russian and Hebrew reading readiness (which alphabet letters were studied, new words), English words taught, arith-metic lessons, and lessons on the Torah portion of the week. Announce-ments may be made about forthcoming events. Another Chabad early childhood program in the city, Ilana (named after a child who died), operates in another building in a different part of Dnipropetrovsk. 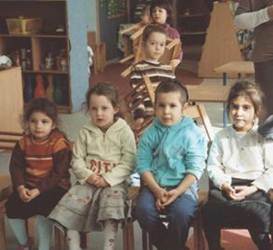 Ilana is a daycare center, currently enrolling 35 youngsters between the ages of one and three years. The main building of School 144 is seen at left. The girls’ machon is behind this building and the boys’ yeshiva katana is to the left of the pictured building. At its peak census in the late 1990’s, the school enrolled close to 700 youngsters, most in the general program. At that time, it was the largest Jewish day school in all of the post-Soviet states and one of the largest in all of Europe. Both the total number of pupils (503) and the number of youngsters in the secular program have been decreasing over the years at the same time that both the raw number and proportion of pupils in the more intensive religious sections has been increasing. The growth of the Chabad religious programs reflects the increasing Chabad population in the city, whereas the decreasing enrollment in the general program reflects both Jewish demographic losses and a perception that the general studies program is inferior to that in many other city schools. The writer spoke with Principal Mikhail Gugel, a newcomer to the school during the current academic year. Prior to coming to School #144, Mr. Gugel taught in other schools for 15 years and then taught in several different colleges, including a pedagogical college. He is a native of Dnipropetrovsk and, he said, he “knows everyone” in the city. His major objective, he continued, is to improve the quality of secular studies in the school; such improvement is critical to attraction of new families and retention of current pupils. School #144 must be competitive with the best secular public schools. Mikhail Gugel is new to School #144 this year. 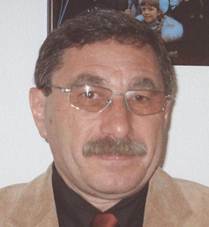 He has had many years of experience in Dnipropetrovsk public schools and in local universities and colleges. Mr. Gugel’s parents live in Israel. Pupils have only six class hours of Judaic instruction each week, three of which are in Hebrew language instruction and three of which are in Jewish tradition. Additional hours of Jewish studies would impinge upon the quality of secular studies offered by School #144, Mr. Gugel said. In addition to formal Jewish education, the school also observes all Jewish and Israeli holidays. Shabbatonim are available to some grades through funding from the Avi Chai Foundation. Responding to the writer’s questions about Jewish demography and enrollment, Mr. Gugel said that all pupils in the school this year are halachically Jewish, but some are from intermarried families. Intermarried families predominate among self-identified Jews in the city, he continued, although some such families are halachically Jewish because the mother is Jewish. School #144 has sustained some enrollment loss in the upper grades, said Mr. Gugel, because a large number of adolescent pupils have gone to Israel on the Na’aleh high school in Israel program. Given available space in the main building and the number of teachers employed by the school, School #144 probably could absorb about 500 pupils, instead of the 235 currently enrolled, said Mr. Gugel in answer to a question. The sister-city program linking Dnipropetrovsk and Boston has been helpful to School #144, said Mr. Gugel. The Boston Jewish federation (Combined Jewish Philanthropies of Greater Boston) provides training for School #144 English teachers, and CJP also supports a winter camp in which Boston and Haifa teens joined their Dnipropetrovsk counterparts for a week of informal education. Having observed the winter camp in February, Mr. Gugel said that the camp program should consider the inclusion of additional education components, for example, Jewish history of Ukraine. In response to a question, Mr. Gugel said that the greatest material need of the school was additional technical equipment and supplies for instruction in science. Instruction in foreign languages, he added, would be significantly improved if the school had headphones with which to equip a language laboratory. Replying to another query, Mr. Gugel estimated that 85 percent of pupil families have computers at home, almost all of which are connected to the Internet. Those without computers, he continued, are permitted to use computers at School #144. It also is likely, he stated, that parents without home computers use workplace computers for personal matters and/or visit Internet cafes. School #144 is increasing its exploitation of computers for communication with patents and is encouraging teachers to post homework assignments on the school Internet site. While visiting School #144, the writer observed a ceremony held in the auditorium of the yeshiva katana in which awards were presented to winners of an ORT school robotics contest that was held in the computer laboratories of School #144, which is affiliated with ORT. 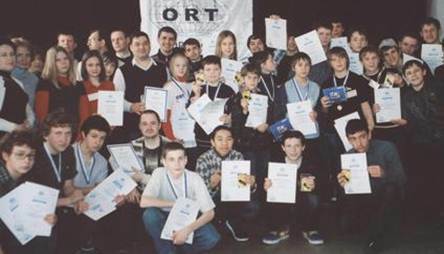 Contestants from ORT schools in 12 cities across the post-Soviet states had been brought to Dnipropetrovsk for a four-day competition in robotics design and operation, as well as local sightseeing. Schools were permitted to enter two two-person teams, one of pupils in 5th through 7th grade and the other of pupils in 8th through 11th grade. Awardees in the ORT robotics competition pose with their certificates and prizes; the latter included cameras and flash drives. Some participates came from as far away as Bishkek, Kyrgyzstan. 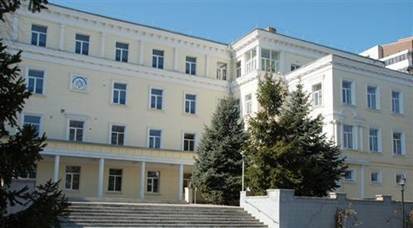 The lead gift for renovation of the building housing the preschool was provided by wealthy industrialist Victor Pinchuk, who named the facility in memory of his maternal grandparents. A native of Dnipropetrovsk, Mr. Pinchuk is married to the daughter of Leonid Kuchma, a past president of Ukraine, and now spends most of his time in Kyiv. He is among the Ukrainian oligarchs who derived great economic benefit from government favor. See pages 20-22 and 24-26 for information about Beit Chana Jewish Women’s Pedagogical College.